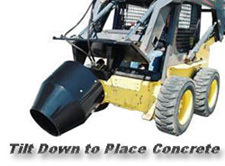 The Heavy duty Mix-n-Place Skid-Steer Drum Mixer is the easily affordable way to mix small volumes of concrete and then place it anywhere it is needed. The mixer is powered by a strong hydraulic motor that mounts to an extra heavy duty carrier bearing. This rugged bearing safely carries the load while protecting the hydraulic motor and seals. A heavy duty universal skid-steer quick-tach along with 3/8” plate mounting components ensure it will stand up on any job. 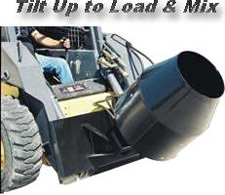 The Mix-N-Place is supplied complete with hydraulic hoses, and quick-disconnects, Just connect to your skid-steer’s auxiliary . Specs: mixer type - rotating drum; hydraulic requirements - 8 to 10 GPM; capacity - 6 cu. ft.